Int. J. Humanit. Soc. Sci. Res. 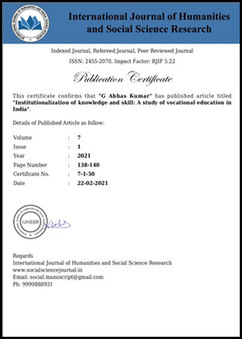 International Journal of Humanities and Social Science Research (IJHSSR) is an open access, peer-reviewed and refereed journal provide intellectual platform for the international scholars. 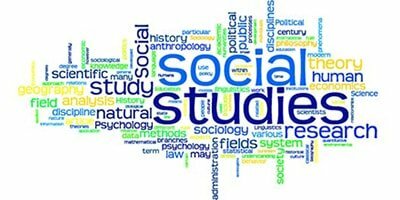 IJHSSR aims to promote studies in humanities and social science and become the leading journal in humanities and social science in the world. The Journal of Social Work is an international peer reviewed forum for the publication, dissemination and debate of key ideas and research in social work. Articles that promote, debate and analyse current themes and issues in social work theory, research, policy and practice. Researches in the field of humanities, social science, Community and Consumer Sciences, Economics, Political Science, Geography, Philosophy, History, Humanity and Languages concerning with social science, Anthropological, Behavioral Sciences, Sociology, Journalism and Role of Media in social science, Role of NGOs in the protection of environment. Educational Sciences: For School Students, Women, Village and Society, Commerce, Law and Management related with humanities and social science, anthropology, business studies, communication studies, corporate governance, criminology, cross cultural studies, demography, development studies, economics, education, ethics, geography, history, industrial relations, information science, international relations, law, health, linguistics, library science, media studies, methodology, philosophy, political science, population Studies, psychology, public administration, sociology, social welfare, linguistics, literature, paralegal, performing arts, religious studies, visual arts, women studies, economics, international relations, development studies, population studies, political science, history, journalism and mass communication, corporate governance, cross-cultural studies, peace and conflict, library and information science, public administration, psychology, philosophy, sociology, women studies, religious studies, social welfare, anthropology, linguistics, education and so on. 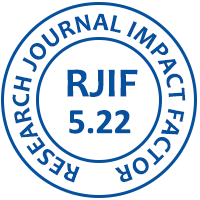 IJHSSR publishes original papers, review papers, conceptual framework, analytical and simulation models, case studies, empirical research, technical notes, and book reviews. 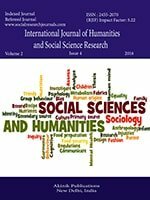 Special Issues devoted to important topics in humanities and social science will occasionally be published. It provides an academic platform for professionals and researchers to contribute innovative work in the field. The journal carries original and full-length articles that reflect the latest research and developments in both theoretical and practical aspects of society and human behaviors.